Remember when you had to drive (or have your Mom drive) to some odd location on an early Saturday morning with a No. 2 pencil in-hand to take the feared SAT exam? Well, those days are over at the Arlington ISD! Now don’t get too excited. We just mean the driving on Saturday part is over because this year, the SAT exam can be taken on Tuesday, April 9 at each high school campus – and during the school day – and the Arlington ISD is paying the fee for each exam! SIGN UP FOR FREE PRACTICE ON KHAN ACADEMY – The SAT® is the only college admission test that offers free, personalized practice to all students. Official SAT Practice on Khan Academy® offers you an individualized study plan that helps you focus on the areas you need to practice the most. It includes thousands of practice questions with instant feedback, video lessons, and eight full-length practice tests. Sign up at satpractice.org. Research shows that students who spend 20 hours on Official SAT Practice gain an average of 115 points from the PSAT/NMSQT® to the SAT, nearly double that of students who didn’t use it. CREATE A COLLEGE BOARD ACCOUNT – You’ll need a College Board account to view your SAT scores when they’re ready. You can also use it to search for colleges and build a college list. 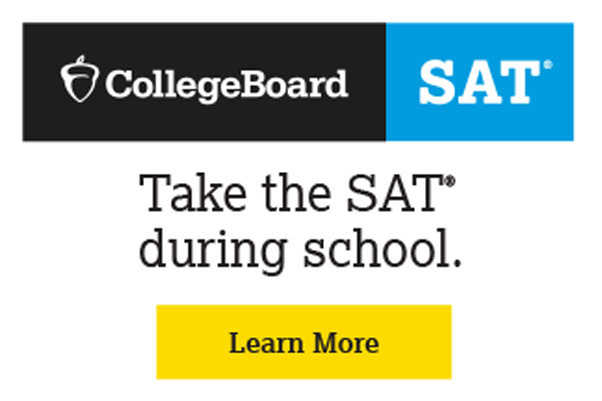 If you don’t have an account yet, set one up at collegeboard.org/mysat. DECIDE WHERE TO SEND YOUR SCORES – On test day, you’ll be able to choose four colleges, universities, and/or scholarship programs to send your scores to for free. Make sure you’re ready with your list. The SAT is accepted by all U.S. colleges. Learn more at sat.org/send-scores. If you have questions about taking the SAT at your school, speak to your counselor. Arrive to the test a few minutes early – Even though you’ll be at your home school, test day won’t be like a typical school day so give yourself plenty of time to settle in, get some water and get ready. Give yourself or your kid a high five. – Taking the SAT exam is a great accomplishment. Be proud of the achievement. More information for parents and students is available at The College Board. As you prepare for the exam, feel free to reach out to your counselor if you have any questions and know that everyone in the Arlington ISD is cheering you on!